The Trail 103.3 is giving away a two-night stay at the luxurious Glacier Highland Resort this Father’s Day weekend!! Tell us your 2016 Summer Playlist (up to 5 songs) and then tune in June 10th as we’ll announce a winner and play the entire block of music! Two-night stay (June 17th, and 18th) in a two-queen bedroom. Basic lodging with restaurant on premises and park half a mile away. For over 30 years, the Glacier Highland has been welcoming visitors to Glacier National Park with comfortable rustic lodging, delicious home-cooked food, local gifts and everything you need to fall in love with the park. The restaurant includes award-winning, homemade huckleberry pie and the best huckleberry pancakes you’ve ever had! Try a juicy burger paired with a cold local beer, rest up in one of their cozy and rustic rooms and then get back to your Glacier Park adventure.! 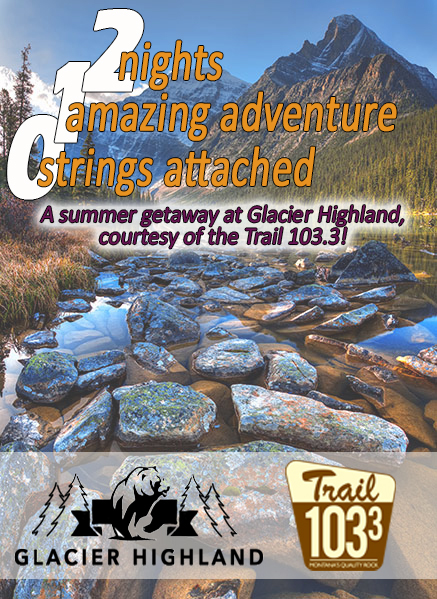 The Glacier Highland is family-owned and family-operated in beautiful West Glacier.